Anyone who has stayed in a hotel in Japan has probably seen a copy of The Teaching of Buddha. First published in 1925, the book was originally edited by Japanese scholars of Buddhism before WWII and distributed widely throughout Japan. The first English edition was published in 1934. The Reverend Dr. Yehan Numata brought out another English edition in 1962, and in 1966, after the establishment of the Bukkyo Dendo Kyokai (BDK) (Society for the Promotion of Buddhism), Dr. Numata assembled a committee of Buddhist scholars to substantially revise and edit a new English-Japanese edition. 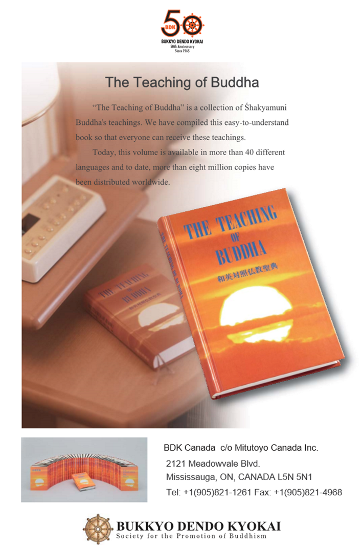 The Teaching of Buddha has undergone minor revisions and numerous reprintings since. It is now available in more than forty-six languages and over 8.4 million copies have been distributed and placed in hotel rooms in over fifty countries throughout the world.